The Hungarian State Opera House (Hungarian: Magyar Állami Operaház) is a neo-Renaissance opera house located in central Budapest, on Andrássy út. 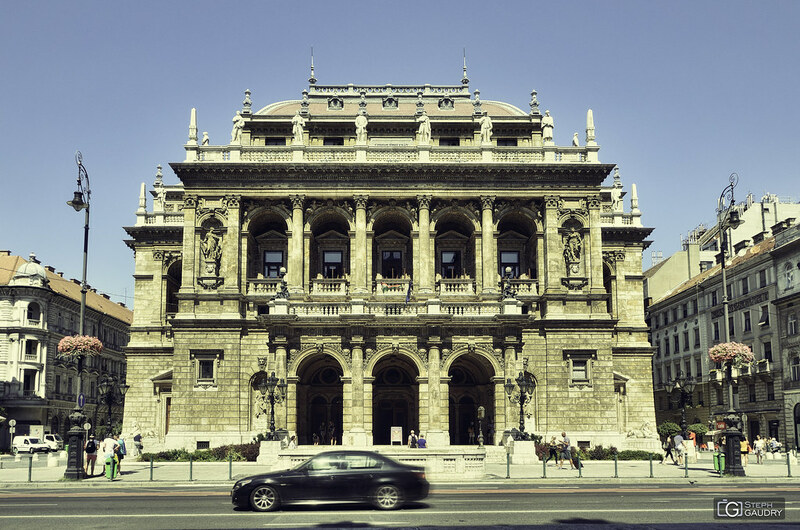 It is home to the Budapest Opera Ball, a society event dating back to 1886. Before the closure of "Népszínház" in Budapest, it was the second largest opera building in Budapest. Today it is the largest Opera building in Budapest and Hungary. Designed by Miklós Ybl, a major figure of 19th century Hungarian architecture, the construction lasted from 1875 to 1884 and was funded by the city of Budapest and by Emperor Franz Joseph of Austria-Hungary. The Hungarian Royal Opera House (as it was known then) opened to the public on the September 27, 1884. Many important artists were guests here including Gustav Mahler the composer who was director in Budapest from 1887 to 1891 and Otto Klemperer who was music director for three years from 1947 to 1950. In the 1970s the state of the building prompted the Hungarian State to order a major renovation which eventually began in 1980 and lasted till 1984. The reopening was held exactly 100 years after the original opening, on the September 27, 1984. It is a richly-decorated building and is considered one of the architect's masterpieces. It was built in neo-Renaissance style, with elements of Baroque. Ornamentation includes paintings and sculptures by leading figures of Hungarian art including Bertalan Székely, Mór Than and Károly Lotz. Although in size and capacity it is not among the greatest, in beauty and the quality of acoustics the Budapest Opera House is considered to be amongst the finest opera houses in the world. The auditorium holds 1261 seats. It is horseshoe shaped and – according to measurements done in the 1970s by a group of international engineers – has the third best acoustics in Europe after La Scala in Milan and the Palais Garnier in Paris. Although many opera houses have been built since, the Budapest Opera House is still among the best in terms of the acoustics. In front of the building are statues of Ferenc Erkel and Franz Liszt. Liszt is the best known Hungarian composer. Erkel composed the Hungarian national anthem, and was the first music director of the Opera House; he was also founder of the Budapest Philharmonic Orchestra. Each year the season lasts from September to the end of June and besides opera performances the Opera House is home to the Hungarian National Ballet. The secondary building of the Hungarian State Opera is Erkel theatre. It is a much larger building that also hosts opera and ballet performances during the opera season. There are guided tours in the building in six languages (English, German, Spanish, French, Italian and Hungarian) almost every day. Facade: The decoration of the symmetrical façade follows a musical theme. In niches on either side of the main entrance there are figures of two of Hungary's most prominent composers, Ferenc Erkel and Franz Liszt. Both were sculpted by Alajos Stróbl. Murals: The vaulted ceiling of the foyer is covered in magnificent murals by Bertalan Székely and Mór Than. They depict the nine Muses. Foyer: The foyer, with its marble columns, gilded vaulted ceiling, murals and chandeliers, gives the State Opera House a feeling of opulence and grandeur. Main Entrance: Wrought-iron lamps illuminate the wide stone staircase and the main entrance. Main Staircase: Going to the opera was a great social occasion in the 19th century. A vast, sweeping staircase was an important element of the opera house as it allowed ladies to show off their new gowns. Chandelier: The mail hall is decorated with a bronze chandelier the weighs 3050 kg! It illuminates a magnificent fresco by Károly Lotz, of the Greek gods on Olympus. Central Stage: This proscenium arch stage employed the most modern technology of the time. It featured a revolving stage and metal hydraulic machinery. Royal Box: The royal box is located centrally in the three-storey circle. It is decorated with sculptures symbolizing the four operatic voices - soprano, alto, tenor and bass.